Greg and Becky Johnson have been called of God to impact cities for Jesus Christ. They are Christ followers with a strong desire to reach, encourage and equip people to continue the point of need ministry of Jesus in the power of the Holy Spirit outside the walls of a church building and beyond the confines of a church service. Greg brings messages from the Throne of God as true spiritual meat for every hungry reader and listener. The messages are relevant, life-changing, convicting and also blessed by God's precious grace. Becky is a woman of great faith that God uses to speak His Word, encourage and genuinely love people. 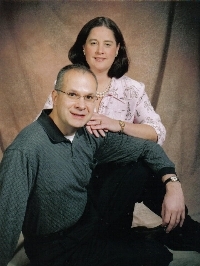 Greg and Becky founded Loving God Fellowship, Inc. in December of 2005. The Johnson's have pastored churches since 1991 and are now encouraging people around the world through this worldwide interdenominational Christ-following fellowship. They have been married since March 1982, and reside in central Kentucky. They have two adult children, Austin and Kelsey. You can find more information information at www.GregoryAJohnson.com.